There are three different types or styles of pool paint that can be used. Epoxy Pool Paints, Chlorinated Rubber Pool Paints, and Acrylic Swimming Pool Paints Each of these have their respective advantages and disadvantages. This article will help you determine the best type of pool paint to use for your situation. Epoxy Swimming Pool Paint is the longest lasting of all of the pool paints, with an average service life of 6-8 years or more. It is the thickest of the paints so if you have an old or rough service, it will do the best at smoothing it out. Epoxy Swimming Pool Paint does the best of filling in hairline cracks and small pots in the surface. Epoxy Swimming Pool Paint gives you the smoothest surface once cured. Epoxy Swimming Pool Paint yields 500 square feet/gallon (on painted surfaces and second coats). Epoxy Pool Paint is the ONLY paint recommended for Fiberglass Pools & Spas or salt water pools. For commercial pools, the Commercial Type Epoxy (such as the Pool Guard Epoxy) can be used at a lower price. Service life is lower than the Pool Guard EHB pool paint. 2 Part Epoxy Paints, such as this product from Sun Paints and Coatings, cure into a resilient, tile-like finish. 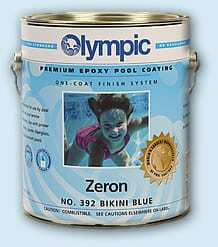 Epoxy Pool Paints come in many different colors to suit your preference. 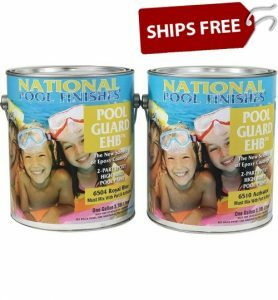 Ideal for those who want the paint with the longest service life (lower maintenance), have an older, rougher concrete surface and you need to fill in hairline cracks and pots, already have epoxy paint on your pool or have a fiberglass pool or spa/hot tub. 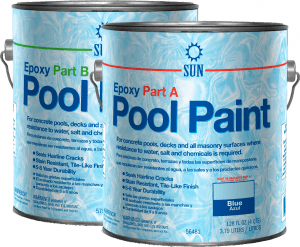 The Epoxy Pool Paints is a two-part paint, which needs to be mixed before applying. Although this makes it a more durable paint, it also requires a bit more work to prepare it and has a pot life (2-3 hours before it starts to harden). Use the Mono Epoxy if you want a 1 part paint. Requires a longer curing time than some other paints. Pool should not be filled for 7 days after painting to allow for full curing. Pool Surface needs to be completely dry before painting – harder to apply on pools in high humidity environments. Price is generally higher than other paints. Painting indoor pools requires extra ventilation and respirators due to fumes. 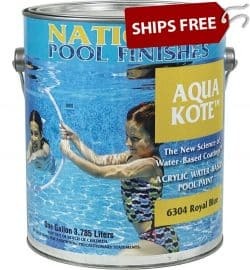 Chlorinated Rubber Pool Paints have traditionally been the preferred type of pool paint. One part paint – no mixing! Cures to a smooth tile finish. 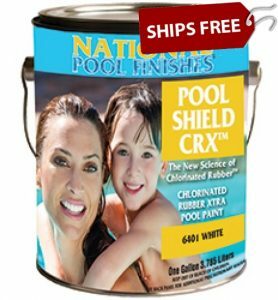 Pool Shield CRX Chlorinated Rubber Extra (Extended Life) has a service life of 5 years or more. Price is on medium tier (less than epoxy, more than acrylic). Ideal for those who want ease of use (no mixing required), have a medium budget and those who already have chlorinated rubber paint on their pool. Pool surface needs to be completely dry before painting. Requires a longer curing time than acrylic paints. Pool should not be filled for 7 days after painting to allow for full curing. Price is higher than Acrylic paints (but service life is longer). Cannot be used on fiberglass pools and spas. 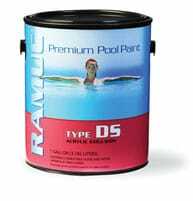 Acrylic Swimming Pool Paints is a 1-part water based paint that is easy to mix and apply. Surface can be damp when it is painted – great for pools in high humidity or rainy environments where it is hard to keep pool dry. Acrylic Swimming Pool Paints can overcoat most any other type of paint (great for situations where you do not know what type of paint is currently on the pool). Comes in many different colors to suit your preference. Ideal for those in high humidity or rainy environments where it is hard to get pool dry enough to paint with solvent based paints, those on a lower budget, those who do not need extended service life (selling a house for example) or those who do not know what type of paint is on their pool and don’t want to prime first. Acrylic Swimming Pool Paints has the shortest service life of all of the pool paints – 2 to 3 years – much shorter than the epoxy paints, which means more frequent maintenance. Not as thick as epoxy or rubber paints – doesn’t fill in rough or damaged surfaces as well. 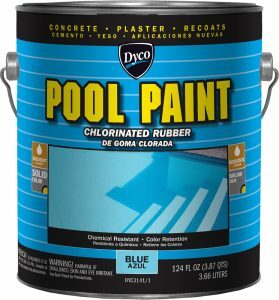 Related Article: Which Pool Paint To Use? 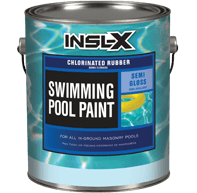 This entry was posted in Pool Paint and tagged acrylic pool paint, chlorinated rubber pool paints, epoxy pool paint, epoxy swimming pool paint on May 10, 2016 by Jason Revie.